When a parent is in jail for the holidays, whether this is the first holiday season since the parent’s incarceration or one of many, kids may be struggling with feelings that are often difficult for them to talk about. Solo Moms, in the meantime, are often dealing with their own extra stressors at this time of year, including financial strain and difficult feelings of their own. How, then, can a Solo Mom try to help the kids (and herself!) cope? Children of incarcerated parents may show a wide variety of reactions and behaviors at school and/or at home. These can include sadness, anxiety, anger, loneliness, and restlessness. Some children might act out more or take out their difficult feelings on the caregiving parent or other family members. Some might withdraw or pull away while others seek more contact and reassurance from the caregiving parent—sometimes to the point of clinging or having separation anxiety. Children have different reactions to the holiday season in general and more specifically about visiting their incarcerated parent. Some want more contact while others want less. Others might feel guilty about the idea of celebrating while their parent is in jail and ask to be excluded from usual festivities or ask that the festivities be cancelled. They might feel angry at the incarcerated parent for “ruining” the holidays, or they might be dedicated to connecting with the incarcerated parent in any way possible. Much will depend on their age, their relationship with the incarcerated parent, the impact on the household of the parent’s incarceration, and their temperament and coping strategies. 1. Take care of yourself. Your kids need your strength right now, and you won’t have it to give if you are neglecting your own well-being. 2. Investigate local and national resources for families with an incarcerated parent. Many communities have programs to help families at the holidays. For example, in 2014, the San Francisco Sheriff’s Department and the Center on Juvenile and Criminal Justice collaborated to provide some incarcerated fathers and their children a special holiday visit with donated gifts for fathers to give their children. Staff took pictures to commemorate the occasion. In terms of national resources, Angel Tree, founded in 1982 by a formerly incarcerated parent, is a Christianity-based organization providing outreach to families of incarcerated individuals. It has a strongly religious tone that may be inviting to some and off-putting to others, but it does a tremendous amount to help children of incarcerated parents, including helping with holiday gifts. 3. Let your children know you’re available to talk, but be willing to give them some space if they want it. Some kids will have an easier time talking about their feelings regarding the situation than others. Also, kids might be reluctant to talk to you specifically about this, especially if your relationship to their other parent was troubled and they are aware of this. Let them know you are there for them in general, for talking or just spending time together, and if it seems that they want to talk about it but not to you, offer to connect them with a counselor or other skilled and trusted adult. 4. Let your children know what to expect ahead of time—especially if this is a first holiday season that their parent is incarcerated. Of course, there are limits to what you know and can communicate in advance, but any information you have can help your children prepare for what will happen. For instance, if there will be holiday visit, find out what you can ahead of time about time limits and privacy. If the incarcerated parent will be calling collect from jail, your children should know that this is expensive and that the call will need to be brief. And if the children want to send gifts, find out what the rules are at the particular facility where the parent is; many kinds of gifts are not allowed, and it can be very disappointing to children to choose a special gift, only to have it refused. 5. Ask for your children’s input on anything about the holiday season that is within the family’s control. Is there a tradition they would like to emphasize, modify, or skip under the circumstances? Is there a way to make the absent parent seem more present, if that’s what the child desires? For instance, if you celebrate Christmas, maybe the child would like to make a new ornament symbolizing the absent parent in some way. 6. Remember that your presence matters, and try to find ways to celebrate the family that you are. One of their parents is away, but you are not. In the midst of what might feel like a tumultuous time, it can be important to recognize and celebrate the connection that you have with your kids and to give yourself credit for doing the best you can in this important role. Your children may or may not know other kids whose parent is incarcerated, and they may feel unlucky and alone. 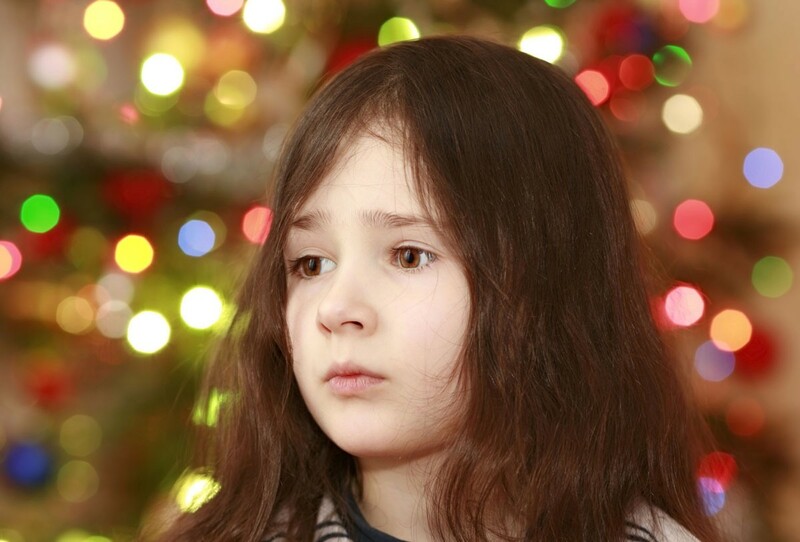 It can help to remind them that many children celebrate the holidays with one or both parents absent, for reasons including parents living elsewhere after separation or divorce, a parent being in the military, or a parent being in the hospital. While it’s important to validate tough feelings, it is equally important to instill, reinforce, and model a sense of focusing on the positive. Celebrate one another, even if all is not as you would hope for your family this season. For more about supporting children with incarcerated parents, read the booklet What About Me? When a Parent Goes to Prison. Though it was written for incarcerated parents specifically, it has several sections addressing the concerns and needs of caregivers and is a very good overview of what children in this situation might be experiencing and how you can help.